How are freeze-dried foods made? How did the space shuttle Endeavour get its name? No one delivers pizza in space. It's sad but true. If you want to grow up to be an astronaut someday, don't do it for the fancy meals! Eating in space presents some unique challenges for astronauts. Why? There's no gravity! If you let go of a piece of food, it will float off and drift around your space vehicle. What about a cup of water? Forget it! Water won't stay in a cup. It, too, will float out and hang in the air. To allow astronauts to stay in space for days or weeks at a time, scientists had to invent special ways of packaging and eating foods in space. 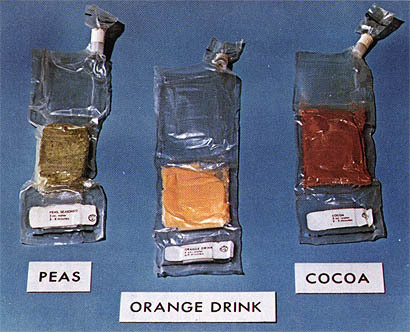 The first such space foods were soft foods (kind of like baby food!) packaged in tubes like toothpaste. For example, John Glenn became the first U.S. astronaut to eat in space when he ate applesauce from an aluminum tube during a 1962 Mercury space mission. He had to squeeze the food into his mouth. If that doesn't sound very appetizing to you, you're not alone. Astronauts weren't crazy about it either. Eventually, scientists developed better, tastier foods that were easier to eat. For example, freeze-drying was a technique that was developed. Food was cooked, quickly frozen, and then dehydrated in a special vacuum chamber. Freeze-dried food didn't need to be refrigerated and would last a long time. To make most freeze-dried foods, astronauts squeeze water into the food packages and then eat the food after it absorbs the water. Astronauts can use hot water to make hot meals that are tasty and nutritious. Some freeze-dried foods, like fruit, can be eaten dry. In fact, you may eat astronaut food from time to time without realizing it. Today, many breakfast cereals include freeze-dried fruits, like strawberries, that are delicious and add color and flavor. Astronauts flying modern space shuttle missions now eat many of the same foods they eat on Earth. Food still needs to be dehydrated or prepared in special ways, but space shuttles now have full kitchens with hot water and an oven. Astronauts can also use condiments, like ketchup, mustard, and mayonnaise, in packets to add flavor. Salt and pepper can be used, too, but they have to be used in a liquid form because otherwise the grains would just float away! Drinks are also dehydrated and kept in powder form in special pouches. The pouches have built-in straws or special nozzles that let astronauts drink straight from the pouch since gravity makes drinking from a cup a messy idea. To make sure their food doesn't float off, astronauts attach their food containers and utensils to special trays with Velcro fasteners. The trays also fasten to their laps, so they can enjoy a meal while sitting down. Nutritionists plan astronaut meals to make sure they get all of the nutrients and vitamins they need to perform their important work in space. Some astronauts begin to experience digestive problems after they've been in space a long time. Experts believe these problems may be caused by a decrease in the number of “good" bacteria in astronauts' bodies. A group of high school students in Jefferson County, Kentucky, is going to help researchers learn more about this issue when the students' experiment flies into outer space on the space shuttle Endeavour. As part of the Student Spaceflight Experiments Program, the students designed an experiment to test the effect of microgravity on Lactobacillus GG, which is a probiotic that could help future astronauts stay healthier in space. In total, there are 16 experiments on Endeavour that were designed by students. This is only appropriate since Endeavour is the only space shuttle named by children. Elementary and secondary students competed in a national shuttle-naming competition in 1988. The winning name — Endeavour — was based on an 18th-century British exploring vessel. The name has caused a bit of confusion at times, though. Many people want to spell it “Endeavor" since that's the American spelling of the word. The space shuttle, however, uses the British spelling with a “u" because that's how its namesake was spelled. If you’re coming to Wonderopolis tomorrow, don’t forget to bring your cape! All over the world, children of different cultures and nationalities stare at the sky and WONDER. Their imaginations are as limitless as the universe itself. Outer space gives families the perfect opportunity to explore the world beyond Earth. The National Center for Family Literacy offers some helpful tips for families who want to explore Space: The Final Frontier together. Ready for an up-close look at astronaut food? 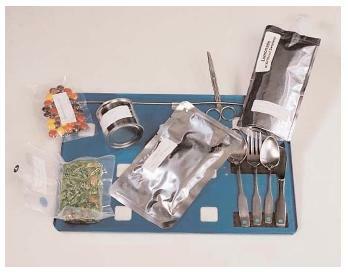 Check out the NASA website to see a Space Food Tray with food samples. What do you think? Does the food look good to you? Would you be willing to give up some of your favorite foods for a short while for the chance to go to outer space? As you sit down for your next meal with your family, talk about how your meal is different from what astronauts eat. Would your meal taste different in space? Would what you're eating be easy or hard to eat in space? Why? Have fun comparing your dinner table to an astronaut's food tray! Want to dive deeper into issues with feeding astronauts on space missions? Explore the information and activities in NASA's Space Food and Nutrition guide. What do you think the biggest problems would be in feeding astronauts on space missions that would last years? How would you overcome these problems? Please cite Wonderopolis as the author and use the date you accessed the file instead of a publication date. Thanks for checking! If you could choose, which flavor of space ice cream would you want to try? I wonder if space food is comercially produced? Woah! I really want some of the Space Ice Cream! Hey, I was wondering who wrote this and when it was published for a school project. By the way, I loved your piece. Thanks for asking, Kate! We ask that Wonderopolis be listed as the author. Since we do not list the publish date for our Wonders of the Day, you may put the date you accessed this page for information. The following is how you would cite a page ---> "What Is a Rube Goldberg Machine?" Wonderopolis, https://www.wonderopolis.org/wonder/what-is-a-rube-goldberg-machine. Accessed 1 Oct. 2018. Just plug in the info from this article. Good luck! What do astronauts eat in space. Do they eat sausages? Not that we're aware of, Angus! Astronauts eat freeze-dried food in space! To learn more, we hope that you read through this Wonder! Great question, jennifer! We have a Wonder that should help answer these questions: Wonder 1986: What Is It Like To Live on the International Space Station? We'd love to hear what you think of this Wonder! Great question, brad! Astronauts eat freeze-dried foods in space! With this technique, food is cooked, quickly frozen, and then dehydrated in a special vacuum chamber. Freeze-dried food doesn't need to be refrigerated and can last a long time. It can be eaten dry (such as freeze-dried fruits), or astronauts can squeeze water into the food packages and then eat the food after it absorbs the water. Astronauts can also use hot water to make hot meals. This was such an interesting article I love space and I wanted to read something about space. That's awesome, Mackenzie!! Have you seen our other Wonders about space? thought : I had no idea that john glenn was the first astronaut to eat in space. connection: I do not want to be an astronaut because I do not want my space craft to have a crash. wwotd: an astronaut is a person. astronaut is a person who goes in outer space. prediction: I think tomorrows wonder will be about how old super heroes are. We're glad that you learned something new with us, Reagan!! What do you want to be when you grow up? FACT:It is not proven the product (Astronaut Ice cream) was actually consumed in space.Studies show that they have no evidence that they ate it according to the astronauts in space. Fascinating, Jace! Which studies did you look into for this information? Thanks for being our Wonder Friend! Hi, thefakewonderopolis! 😜 Thanks for WONDERing with us!! Good guess! What did you find out after reading the article? whta exactly do they eat and drink? You may find what you are looking for in our Wonder Sources in the box at the bottom of the article. Thanks for WONDERing! This wasn't helpful!!!!!!!!!!!! I need a list!!!!!!!!!!!!!!!!! Sorry this wasn't quite what you were looking for! But if you're interested in finding more, we encourage you to take a little Wonder Journey to see what else you can find. Have fun! Sure, Lokesh! What part of this Wonder do you need help with? I wonder how the dehidrated food tastes like in space is it cold,Mushy,tasteless what do you think? We doubt that it tastes very good...food that is dry generally doesn't taste good. But that's a good question! What's up, Dani? What did you like about this Wonder? How do astrountants get freeze dry food in the special chamber? How much fuel does a space ship need to get to the moon? I liked the WONDER words :) :) :) :) :) :) :)! I like hearing your wonder of the day they are really awesome. Wow that was really weird!? I always wondered how the astronauts eat food in space thank for the information!! I always wondered that! This is cool! That was super cool and the video was cool. I didn't know they used special nozzles. I think it would be so cool if, while eating your cheerios, they completely float out of your lap! At this science place, they have an exhibit on astronauts. They showed the typical bathroom, fridge and bedroom on a space ship. After looking at the space food, I don't think I will ever be an astronaut. I don't think I would ever want to eat food that has had all the liquid sucked right out of it. But, of course, being an astronaut must have some pluses. Like, you get to see the earth with your own eyes and you get to actually be in space! So, I think it would be pretty cool to get to eat your food while floating, but I don't know about the food they will be serving. hey wonderopolis. You know I was always curious on what they eat. My family though once went to a science museum named Cosi and went into an exhibit about astronauts. They showed us some of their food. It was really cool! :) On the other hand it does not sound so tasty. 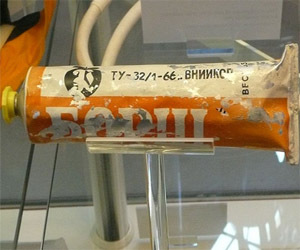 The first space foods were soft foods packed in squeezable tubes like what other product? Who was the first U.S. astronaut to eat food in space? Which force makes eating and drinking in space difficult?